Here’s a little belated #TBT for you! Halloween is coming up, and is frequently the topic of discussion between myself and my students. (“I’m gonna be a dead race car driver!” Creative.) I sometimes make a point of telling them that Halloween is not quite the same when you’re an adult. The emphasis is less on your fantastic costume, and more on how to get the more belligerent trick-or-treaters to stop doorbell-ditching your house.Yes, I’m slowly turning into the “Get off my lawn!” woman. Sure, some of my more festive friends host little parties, usually involving pumpkin carving or a horror film screening, but that’s about it. While I lament this “aging-out” of Halloween fun, I’m totally satisfied knowing that there once was I time where I celebrated Halloween in the most ridiculous manner conceivable. As some of you might already know, I went to college in Santa Barbara, which also happens to be land of the week-long Halloween. This is not an exaggeration. Every year, thousands of college students would make the pilgrimage to Isla Vista, and fill the flood light-lined streets. It was a whole weekend of mayhem- streets were closed and mounted police invaded our beachside town to corral the mob of costumed students. 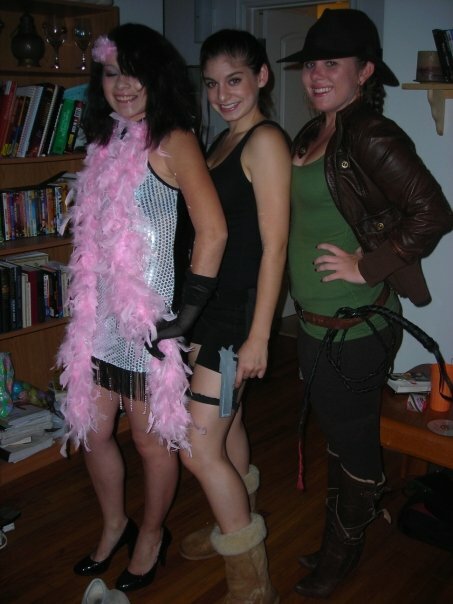 Speaking of costumes, you were some sort of loser if you didn’t have at least three different costumes lined up. 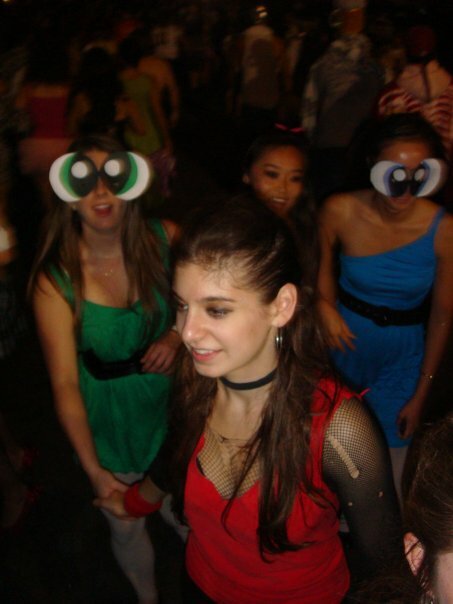 Case in point, the below photos are all from a single Halloween my senior year. I was an 80’s rockstar, who, by the end of the night looked like Alice Cooper, as we all got caught in a surprise downpour and my mascara ran down my face, leaving black tracks. A pirate, a rag doll, and myself, alongside the Powerpuff Girls. Oh, and a grown man dressed as a crayon in the background. Walking down Del Playa Dr. One of the main streets in Isla Vista. 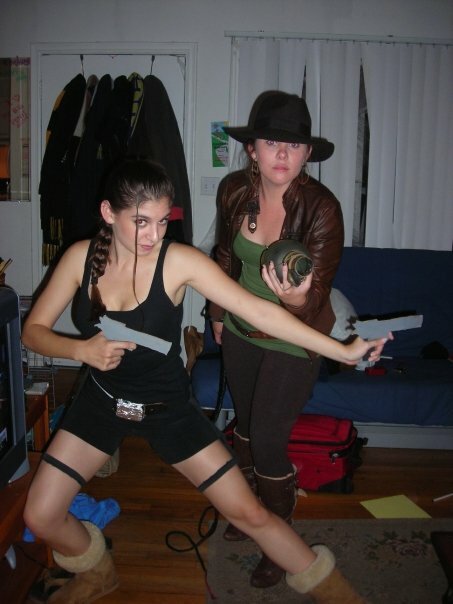 I was also Lara Croft from Tomb Raider, which was possibly the most comfortable costume ever! My version of Lara Croft wears Uggs, okay. My roommate Maren and I made quite the team; she went as Indian Jones. I brandished my two-dimensional guns, and she discovered the lamp in our living room…so many adventures. Photos c/o Maren Masterson & Jessica Rodriguez. Hi ladies! We always managed to host a new group of friends in our living room every year. It’s not everyday you come back from class and have to step over five people to get to your room! Costumes not pictured that I wore the same year are: Mango, the Chris Kattan inspired exotic dancer from SNL, “Super Gaucho” our school mascot, and a fairy, specifically for ballet class the day of Halloween proper. A total of five, altogether. 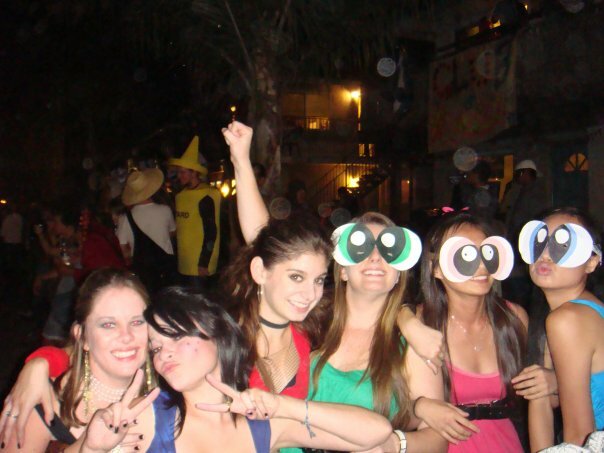 After that, it’s hard to find anything that lives up to the Halloween memories of my college years. No matter how spectacular your costume is, it’s just one costume. And you might be surrounded by friends, but not all of them want to sleep on the floor of your living room, or want to take twenty deliberately embarrassing photos to post to Facebook. Those were the good, uncomplicated days. There’s a lot of things that I miss about them. Gaucho ’til I die. My mind is blown…. mustard? !